From 0 to 60 in -? Long time lurker first time poster. I only just discovered the Twiddler about 6 weeks ago, and have just put in an order for one today. I thought I would chronicle my experience going from never having heard of the Twiddler to (hopefully) 60 WPM or more, and give other new users some idea about what the learning curve might be. By way of preparation I read all the documentation, and took a look at the typing tutor, configurator, and forum posts just to get an idea of how things worked and what peoples thoughts were, and to see if the Twiddler was something that I thought would be helpful for me. In the end I went with Backspice (Thanks @AlexBravo !). There were a few reasons for this. The first is that Alex is a programmer and uses his Twiddler in almost the exact same way that I will be (MacOs, coding, etc). This means that his layout is the most likely to be optimized for my usage pattern. The second is that Alex is a long time user with a tremendous amount of experience - and he is still extremely active. He continues to tweak and adjust things as improvements come up. And finally, he has a number of MCCs that are based on various n-gram data about the english language, and that seemed like a good set of optimizations to me. Once I settled on a layout, it was time to start memorizing. In one post ( http://forum.tekgear.com/t/how-fast-are-you-getting/50/17) there was a discussion of "Air-Twiddling". This seemed like a good way to learn so I have memorized each key/MCC combination while "Air-Twiddling". I do most of my practicing while walking or driving (I do street signs and billboards for variety). While I'm sure that I will have to make some adjustments when I get the actual device, I have so far memorized the chords for the full alphabet, all 29 MCCs, and about half of the symbols. Once I got a good way through the chords and gained some (hypothetical) proficiency I felt that it was time to make the purchase.... and that's where things stand currently. So now I'm waiting for my twiddler in the mail, and once I get it I will start using the typing tutor to gain real-world proficiency. I'll continue to post my experiences here so other new folks can get a sense of what sort of investment starting from scratch would be. The length and size of one's fingers may make some layouts more effective than others. Curious to hear more about your progress. Thank you @dansteen for a writeup. You must be the best learner of the Twiddler I have ever encountered. I really hope you are able to reach 60 wpm or more. I finally got my twiddler in the mail and have had a chance to use it. It's smaller than I expected - a good thing! There is also much less finger "travel" than I expected, and I definitely had to make some adjustments from my "air twiddling". One thing I did notice with the tutor, is that if I change any of the times in the "settings" panel (like increasing the complexity or adding symbols) the tutor stop tracking my speed and won't progress to the next set when I have completed a set. Is this a known bug? Anyway, my plan is to practice for 5-10 minutes per day (and continue my air twiddling). I'll post stats updates here weekly or so (so I don't spam the board). Why not use the untethered-recording mode (N+S 00M0) for air twiddling? I would probably have to disconnect the Twiddler from my phone for that first right? When you enter the recording mode with the NS combo, it automatically disconnects itself from bluetooth; it reconnects to bluetooth when you exit the URM. I started air twiddling the past few days, recording every street sign. I review the record at the end of the day to pinpoint which chords need more practice or remap. I am building a new chord map, Cool Hand, integrating ideas from TabSpace and BackSpice, optimized for working with vim/bash/mutt, expanding on Dial with Fingers. @dansteen, I am curious how do your plan to use your twiddler primarily. I'm averaging about 15wpm across all keys including symbols and MCCs. Not too bad after about 6 weeks of daily practice (about 15 minutes a day). However, due to my specific workflow, I have, found some inefficiencies in the backspice layout that are unique to the work that I do (linux command line mostly). This is not to say anything bad at all about the layout - it's an amazing work - just that my use-case allows for some other optimizations than Backspice includes. I'm going to try out the coolhands layout ( which is designed for linux command line) and see how it goes. I'll continue posting here. @dansteen would you please also post the detailed progress for the last ~10 days when you are using Cool Hand? Sure. What information are you looking for? I just tested my speed and I got 23 and 25. It's a little discouraging because I've been actively using twiddler for 6+ months now, especially at work. I know where the commonly used keys are but I still do things like type z instead of x, or v instead of ar, or mix up o, e and i. Anyone have advice for breaking through to higher speeds? I'm using a slightly modified backspice layout. @dkburrows how old is your version on Backspice? I moved several chords around recently to a better place. mix up o, e and i. Looks like you need to practice your middle finger. Overall, how are you practicing your speed? @dansteen how is your speed doing? Are you still using Coolhand? I don't think there's anything special you need to do, other than typing every day. 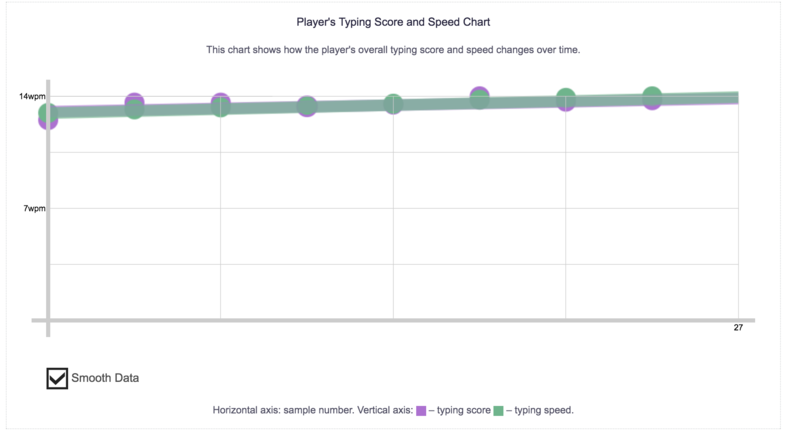 I type about 50 WPM now and I don't think I ever broke through any speed barriers... I just gradually get faster. The only "big" transition I can think of is that for my first year at least, using the Twiddler took too much mental effort for me to do all my work on it, but now it doesn't, so I get more practice just because I don't need to switch away. I think a really driven or talented person could improve faster than I have, but I don't think being in the 20s after six months is doing poorly at all. My version is from just after you moved s from middle to left (I always get right and left confused in the twiddler terminology as I think of left as my left with the twiddler facing away, not toward me). I think you might have relocated either z or x since then. Most of my backspice edits were to clear out the gui keys so I could use Num for work shortcuts. I added a few chords like ir, shift+tab, and one or two others. I'm considering moving the numbers so that the pinky holds down the anchor instead of the pointer as my pointer finger gets a little irritable when bent all the way for numbers and long left-clicks. I suspect I might need to not look at the screen when typing so I'm not double-checking as I type. My practice is just use it at work and sometimes at home. I measured it on some randomly selected website. It just feels like I'm not progressing much so I thought I'd see what other people have done. I sometimes feel like I've picked up speed, so maybe I was at 20 for awhile and have drifted up to 25 now. 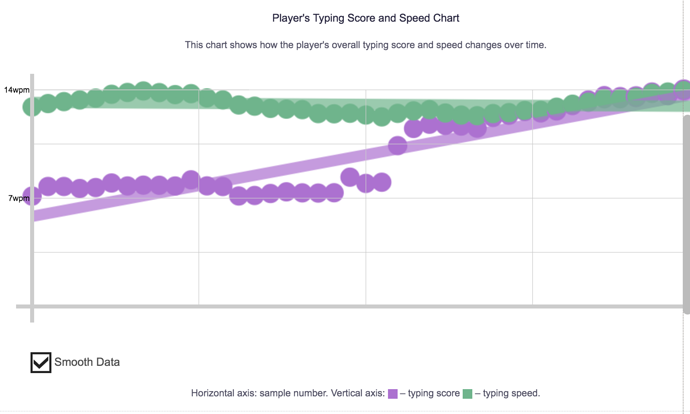 I do 60 or 70 on a regular keyboard, but on the Twiddler I get slowed down by mistakes. I can't seem to correct certain frequent errors (OOML instead of OORL for instance, which is v instead of ar). I was hoping there'd be some suggestions for things like 'look away from the screen when typing' (which I think does help). Whenever I get a call and have to listen and type I switch back to the regular keyboard, so it apparently isn't embedded in muscle memory just yet. 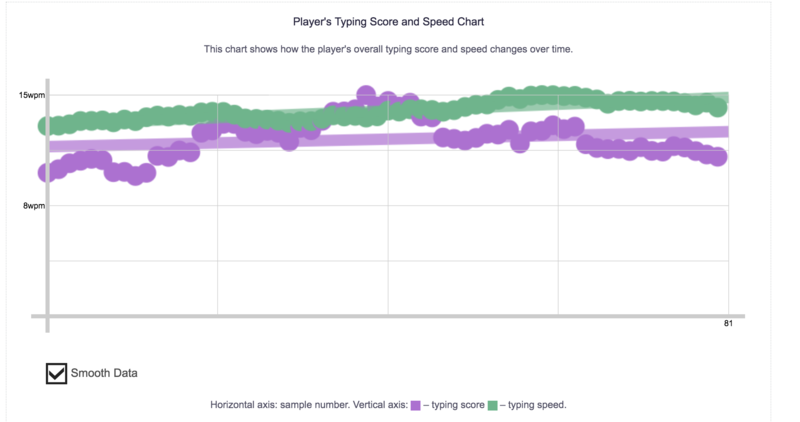 Sounds to me like you need speed when you listen and type and 25wpm is not cutting it, so you switch to a QWERTY keyboard. If you need speed, you need to practice for speed. keybr.com pretty much forces you to type at least 35 wpm, or they will not give you the next letter. Did you "graduate" from their course? Not having a visual feedback loop is definitely going to speed things up. This "air twiddling" thing you probably heard about is for making you get used to pressing chords on Twiddler without seeing (or caring) what actually got typed. Try doing more of that.